American Debt Enders is a free for-profit debt counseling service that refers their clients to various programs that include credit repair, debt disputes, debt restructuring, and credit counseling. American Debt Enders is a for-profit debt counseling program (operated by Grace Unlimited LLC) that offers free credit counseling to determine your unsecured debt relief needs. American Debt Enders does not charge any fees for their services; instead, their affiliates will set their own fees and terms, so be sure to thoroughly research each company before signing up with them. Unique debt dispute program: American Debt Enders offers a special debt dispute program (not a debt settlement, modification, or negotiation program) through their sister company Infinity Consumer Services. Customers can qualify with as little as $2000 of unsecured debt, and the program allows for full legal coverage (should any creditor legal action occur), full elimination of the debt (90% of the time), and complimentary enrollment into a credit restoration program upon finishing the program. Call (855) 259-9684 today to see if you qualify and to learn more details. Transparency: American Debt Enders has an informative website which lists important information, such as their services, referrals, and debt partners. They even include an educational blog and a comprehensive FAQ section on their website that covers everything from different types of debt to enrolling in debt management programs. Free consultation: American Debt Enders offers a free consultation through Peak Legal Advocates to connect you with an affiliate program and a licensed lawyer who practices in your state. Licensed attorneys: All debt dispute cases are handled by licensed attorneys with full legal coverage. American Debt Enders and Grace Unlimited LLC are not listed with TrustPilot or accredited by the BBB, AFCC, or IAPDA. Due to their referral service, American Debt Enders cannot offer any guarantees. While we appreciate their informative website, it is rather difficult to navigate due to the number of links that are spread throughout the page. The same amount of information would be more helpful for potential consumers if it were laid out in a more organized fashion. 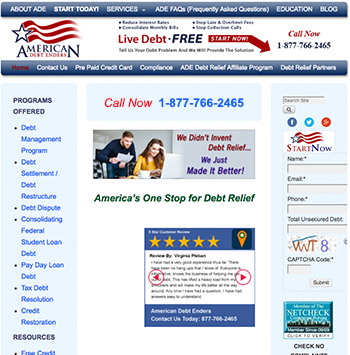 American Debt Enders services are available nationwide depending on the program. American Debt Enders requires clients to have a minimum of $5,000 in unsecured debt, such as credit cards, department store cards, medical bills, or repossessions. Debt disputes tend to be 20% less expensive than debt settlement. The Debt Dispute Program is usually resolved in 12 to 18 months, no matter the program length. Because you are referred to affiliates, your terms, rates, and amounts will vary with each company. Their program length is around 60 months and varies depending on the individual. The minimum debt needed to enroll for American Debt Enders is $5,000. Can I use my credit cards while I am enrolled? All of your credit cards enrolled in the debt management program will be closed. However, your debt counselor may advise you to keep one or two cards out of the debt program in case of an emergency. What are the qualifications for these programs? You must have a minimum of $5,000 in debt to qualify for debt management programs. American Debt Enders' debt dispute program requires only $2,000 of debt to qualify.